Ronnie Fuson Rock'N Soil, LLC. 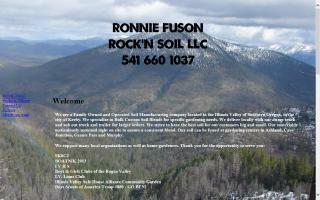 Soil manufacturing business located in the Illinois Valley of southern Oregon. Family owned and operated. serving professional and personal gardens. Independently owned and operated, seller of certified organic seeds, bulbs, roots, tubers, sustainable gardening books, and hand tools. Horizon Herbs, Irish Eyes Garden Seeds, Seed Savers Exchange, and Southern Exposure Seed Exchange. Many of our seeds are heirloom, most are open pollinated, and every seed on our site is 100% certified organic. We also have a "Bulbs, Roots, & Tubers" catalog for asparagus root crowns, seed garlic, onion sets, seed potatoes, and shallot sets. We offer bulk quantities for farms and we have smaller amounts for gardeners. Everything in this catalog is certified organic.